The political conflicts Venezuela is currently experiencing hastened the departure of two of the 335 mayors chosen just last December. The vacant spots will be filled on May 25th, when the districts of San Cristóbal, capital city of the state of Táchira, and the municipality of San Diego de Carabobo attend the polling stations to elect new authorities. Normally, calling for elections and organizing them in less than two months —the destitutions took place in March— would be a daunting challenge for any country, but not in Venezuela. Since 2004, this South American nation has been using a flexible and safe system that enables a completely automated suffrage, and makes the organization of an election a much simpler task. 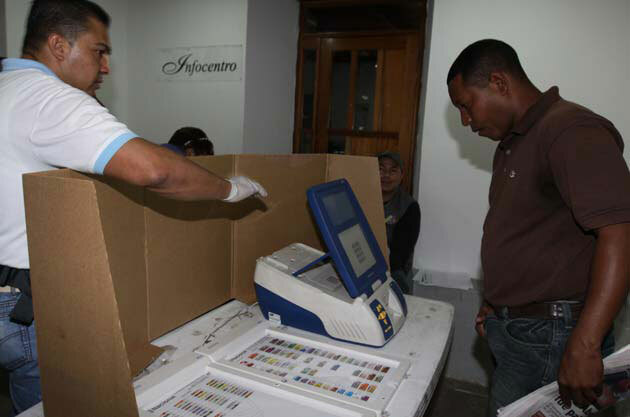 This very same technology, provided by Smartmatic, allowed the National Electoral Council in 2013 to organize a presidential election in 34 days after the demise of president Hugo Chávez. Thanks to technological and knowledge transference, the electoral authority now has all it takes to successfully conduct all the stages of the election, including voter authentication through fingerprint scanning, voting through touchscreen devices with electronic ballot, automated scrutiny, and even the announcement of results on the electoral body’s website. One aspect of the system which is particularly interesting is the level of auditability it offers. Despite the little time authorities had to set up the voting platform, 13 tests will be performed to allow technicians from all the concerned parties to audit the electronic voting machines, biometric identification devices, aggregation software, etc. In addition, and after the election, a closing audit will take place. This consists in proving that all the vote receipts deposited in approximately 54% of the ballot boxes match the scrutiny minutes. Just hours away from these elections, Venezuela is ready to go. The e-voting platform certainly played a key role in allowing these elections to be executed in less than 60 days. In the midst of a spectacular shift in opinion polls in Colombia’s presidential race —Juan Manuel Santos (incumbent candidate) has been surpassed by Oscar Iván Zuluaga—, the country will conduct a new electoral process on May 25th under the shadow of doubt. 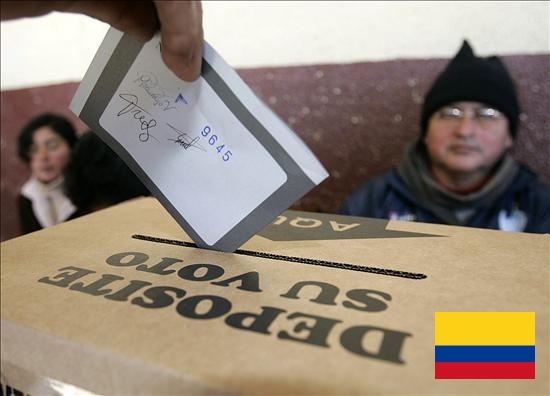 During the recent legislative elections held in Colombia in March, the electoral flaws that have harmed the trust of voters and political parties alike for years, surfaced again: vote buying, delays in the result announcements, complex balloting material, and a striking high percentage of invalid ballots (more than 10% of the cast ballots). Unfortunately, for these new elections, the situation doesn’t seem to have improved much. One of the most concerning aspects is the tallying system authorities conduct, which involves the infamous pre-counting, a process by which authorities evade the responsibility of delivering official results on the same day of the elections. Through this procedure, members of the jury count the votes and fill out two forms with the information gathered. The first form is the “vote counter,” which consists of a series of boxes where each candidate’s votes are marked one by one and at the bottom it shows a total number. This number goes on the other form (the official minute). The data of the “vote counter” is what is announced to the people on the day of the election for information purposes only, as the final results must wait for the official scrutiny. In previous elections, results from the Pre-count have differed from the definite tallying made official, raising questions about the transparency and accuracy of the system. During the last elections, the Democratic Center, the party of the former president and now senator Alvaro Uribe, questioned the results and even released a statement pointing at this difference to substantiate their claim. In spite of all the problems generated by manual voting in the past, and even though Colombia has had laws allowing the implementation of e-voting for ten years, modernization of the system has been further delayed until 2018. In order to achieve a better performance this time around, the Registrar’s Office scheduled three drills (May 3rd, 10th, and 17th) to test out the critical phases of the presidential election: pre-count, tallying, and digitalization of voting minutes. Flaws were detected on the first two election drills, which according to the authorities, will be fixed for the last test. It is unfortunate that Colombia has opted not to face its need to hasten the implementation of e-voting. A new deadline has been set four years from now to put an end to elections with late results and fraud accusations. Let’s hope that this new deadline is enough for the country to finally get a seamless and safe system that defends the people’s intent. 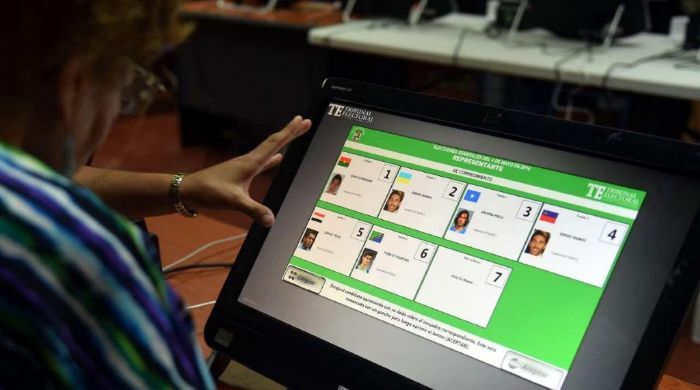 A Panamanian precinct used e-voting during the May 4 general elections. Last May 4th —during general elections— Panama took a firm step toward establishing an electoral system capable of protecting and fully guaranteeing people’s intent: electronic voting. The Electoral Tribunal (TE) automated one of the electoral precincts (José Antonio Remón Cantera school at Panama City’s Paitilla sector) during the elections where a new president, 71 deputees, and 77 mayors were being chosen. The experience involved 4,859 voters —out of the 2.4 million called to vote. Panama’s e-voting model reproduces many specifications from systems that have already been tried in other countries. Elvia Muñoz, president of TE’s Sub commission for Electronic Voting, explained that the voting dynamics are very simple. After voters validate their identity, they receive a card to activate the touchscreen voting machine. The names of the candidates are then displayed for selection. In case the voter wishes to change the selection, there is a key to clear the screen and vote correctly. The voting machines have been designed to produce a printed vote receipt on paper, which remains as proof of the vote’s electronic recording. The experience, which was deemed successful by the authorities, shows what technology can do for electoral systems, as the automated scrutiny matched the manual counting of printed vote receipts. Although in this first event Panama scored points in light of the forthcoming nationwide automation, TE must take action to optimize the system. It is vital to keep developing the machines so that e-voting covers the whole process, from voter authentication, to voting, vote recording, tallying, and result transmission. Besides, it is important to make sure that the system is auditable by all stakeholders throughout all its stages. Another pending issue to correct is ballot design. During the election, deputy candidate Alvin Weeden’s picture was left out. The incident generated confusion among voters, something unacceptable for any electoral process. Panama knows now from the experience that electoral technology is the best ally to guarantee electoral results. However, it also learned that using it effectively is vital to shield the process and earn the country’s trust.